The Surgery happened!!! After 2 hours my hernia and varicose veins were removed and replaced by stitches and gauze bandages. I spent a boring night in the hospital and went home and rested there. The worst part was laying on my back, it was so boring. I have been walking and working a little bit but I have to be very careful not to strain my stomach. Most of the stitches are now out and I am looking forward to July when I should be all healed up and able to go swimming in the ocean. That was the worst part of the leg ulcer I had last year, not being able to go swimming. Maybe I will even get to go to the waterpark with the kids in July. The Summer Mission Adventures season has started, I am working with various young people from different states, Canada, and England too; that's the best part of my job meeting lots of different people. Its also the hardest part, every day in the kitchen is somebodies first day on the job so every day we have to explain every thing as best as we can and hope for the best. YWAM's foundational values involve prayer, worship, championing young people so they can do ministry, working in teams, evangelism, and value families and individuals...good stuff like that. I have come to the realization that working as effectively and efficiently as possible is not listed. I haven't had a chance to ask the founder or a senior leader if that is intentional or not. But, anyway, we continue our work and keep doing evangelism, and Mercy Ministries and teach others to do the same. Misty has been working a lot to take up my slack as well as everything else she was doing, and Joey and Emily are almost done with school for the year; Emily will graduate from kindergarten and Joey will finish 2nd grade. Next year they will be together at the same school, that's going to be a wonderful thing especially for mom when she is taking kids to and from school. Also next year of school it will be within walking distance as well so that will be fun too. I am writing this note to share some information about my health and let my friends know how I am doing and what I need to do next, and how everyone can participate in this challenge I face. I have had varicose veins in my right leg since I was in my 20’s but it didn’t bother me, so I didn’t really think about it too much; as time has passed (about 23 years) this has become a big problem. I have edema in my right leg and the area below the knee has vein failure, leading to venous ulcers in the leg. During the past year I and I have found how serious and painful these ulcers are. Last spring one of the ulcers got out of control and quickly grew to be the diameter of a golf ball, with about ¼ of an inch of depth. Sometimes it hurt so bad I couldn’t think straight. I didn’t know how to take care of it and I spent a couple of months taking a lot of extra ibuprofen and kept it covered with a bandage hoping for it to heal. Finally, I went to a doctor and later, I started seeing a vascular surgeon; with his guidance I was able to get the wound to heal. Now that the wound has healed, I am keeping the edema down with support stockings and bandages; I also walk in the morning for at least 30 minutes, if time allows I can go again in the afternoon. This is helping a lot to keep blood circulating in my leg. The underlying varicose veins condition remains though, and I have to be very careful not to let an ulcer get out of hand and go through another long, painful healing process. I also have an umbilical hernia that needs to be cared for. I can’t ignore these medical issues anymore, I need to get an “overhaul” so to speak, and I am planning to go to a local hospital and have the varicose veins removed, and get the hernia fixed. Maybe when this is all finished I can get some pinstripes and flames tattooed on my thighs. I have insurance, but because I am working at the Ensenada operating location I need to pay first and then submit a claim and get a refund . This is going to cost about 8 thousand dollars to pay for the 2 procedures, hospital stay, and anesthesia. After all this I will then have to spend several weeks being careful to not lift anything or strain my muscles. I think this will be the hardest part of the whole process. I like to actually do things more than tell people to do them! But, I am excited about getting healthy again and being able to continue the work I am doing at the Ensenada Mexico YWAM base. It is truly a blessing to be here with my family, and especially to work together with my wife Misty. So, I need to raise 8 thousand dollars, and I am asking for help to get the money to get fixed. I know that not everyone can give, but everyone can pray! And if you can give, then that would be great too! Pray: that the leg will stay healthy enough to do the operation, and that the money to pay for it will come in. Also, pray that we will have sufficient volunteers to come and help while I am recovering from the surgeries. If you want to give financially, you can send a check to the address provided; please put a separate note on the check letting the finance office know it’s for William Moss. You can also go to the staff pages on the YWAM San Diego Baja website and click on the donate button to give electronically, what could be more easy than that? Here is the web address for my staff page. Spring is here and Emily's class celebrated by dressing up in different spring animals. She is a "Princess Duck". Joey's school took a different approach and celebrated opening up a new Library at the school. The theme was Brazilian and he had to dress up and dance to a cool dance. School events are always fun for us. It's great way to get out into the community and talk to people about what we do and why we have chosen to be here in Ensenada. Recently Misty had a conversation while doing laundry, the young lady asked why do you live here, I've been trying for 5 years to move to the states. The US is such a great place, and there is more opportunities for your kids and for me. Misty said you are very true, the US is a great place so is Ensenada, Australia, Canada, the world is amazing, and there are opportunities everywhere you go! IF you can't get into the states due to Visa issues than try another country. Forward is our Mission Adventures theme. This spring we had over 400 students come and build houses, dress up like clowns and give hope, balloons and love to kids in orphanages, and in neighborhoods. Joey and Emily are right in the middle of everything! They watch the students prepare for outreach, they get to know the students and adults. Most likely we find Emily getting her hair done, her nails painted, and sitting with the girls for meals. Joey hangs with the boys learning new games, making new friends, and having good memorable times. We like to hear the insight Joe has to the teachings are music that is being played. It's fun seeing how ministry is affecting our kids, and how their faith is beginning to grow. It's been a couple of weeks that our mom has been living just down the street. We see her everyday now and that's been great! She has helped make the 400 sandwiches over MA, and is helping in the finance office. 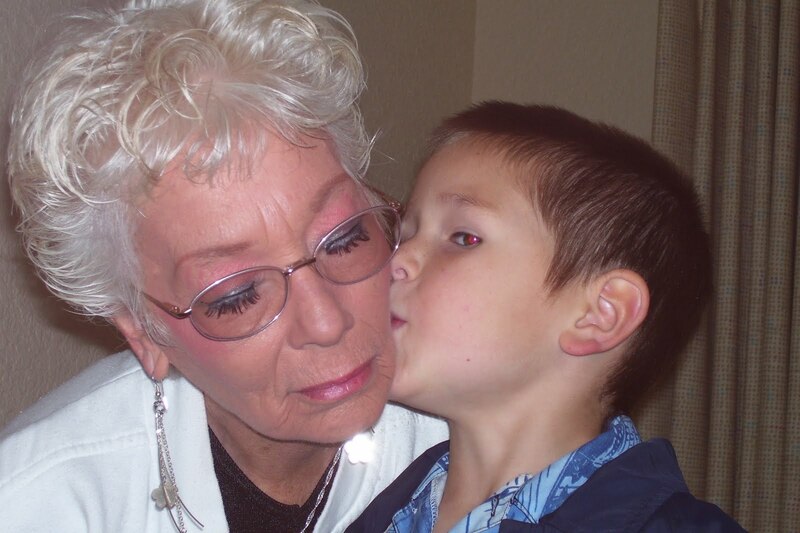 She looks great and is very happy to be serving and loving her grand kids! I have been pretty busy lately, we have had Mission Adventures going and building happening as well, the pace is challenging but it is better than sitting around doing nothing. I got to have a nice day off on Friday me and the family went to breakfast at a local restaurant and then watched a movie. We watched the movie about how to train your Dragon. Joey really liked it the most it was really something a 7 year old would like. I have been having to learn about how to delegate jobs and teach others how to do some of the jobs that I do. I can't keep on doing everything myself forever even if thats what I want to do. I learned how to cook on a Submarine, where you do it all alone and you better get it done on time or you are in a world of hurt. Thats a good thing and a bad thing. So I am learning to let go, let others be free to fail, trust others.... its really hard for me, because I really like CONTROL!!!! With the Eartquake in Haiti, and the flooding here in Ensenada we have been in relief mode. Relief #1 We had a tremendous rainstorm and it caused a lot of flooding, the Alvarez family, who we built a house for two years ago was evacuated, and they were placed in a cold metal roofed building with no beds, or blankets. Scott, a mission builder who is working with us in the kitchen knew this family from that house build and went for a visit. He saw how this family was living and arranged for them to come and stay at the YWAM base in a guest apartment, so they could have nice warm beds to sleep in before returning home after the flooding danger passed. Knowing that this flood had impactd a lot of families in our area we took some hot oatmeal and fed several hundred people who had been displaced due to the flooding. Relief #2 Nationally YWAM is getting very involved in the relief work that is now going on and will be going on in Haiti. Here is the most recent update from YWAM Haiti, the Director Terry Snow gave a great story of what YWAM is doing in Haiti. The search for survivors has ended and now there are a lot of people to feed,temporary tent cities are going up, and the country is going to have to be rebuilt. Many Haitians are now turning to the Lord for their lives and abandoning the Voodoo religion. For the next year or two, there is going to be a lot of teams from all over the world going to Haiti on outreaches. We already sent a group of 5 from YWAM San Diego Baja for three weeks to help administer the Haitian YWAM base and help organize all the volunteers that are coming to help. The YWAM staff team already there was overwhelmed with how the earthquake had affected them and also trying to deal with all the volunteers that were coming. Our group met a lot of people, that were devastated by the earthquake, and saw things that they will remember forever. Now this first group has come back and we are getting ready to send another team, who knows, maybe the Moss family will go down for a few weeks to help out. Final Relief... It has been such a huge blessing to have Jim Forgason here with us from SCF! He's been here almost 5 weeks and each week and day had been a relief to us! We are very greatful for his service here, and seek out more people to come down and "Mission Build" with us. You can choose a weekend, or a few weeks up to 6 months. We believe after 6 months of serving you should just become a YWAM'er. If you are interested in coming down to help us, write us and let us know! It'll be a great experience! The Homes Of Hope Ministry has started a new Childrens program, this is a help here at the campus, during the time when moms and dads are being given all the information, and begin the process to be selected to receive a home. Bill played his guitar and had the kids singing some spanish praise songs that are the kinds of songs that kids sing at Vacation Bible Schools and camp. This is bringing us back to the 90's when Bill and Misty made their first trips to Ensenada, Mexico and working with Rancho Agua Viva. While the singing was going on the kids were also working on their craft project, Emily joined in with the other kids and made a little flower vase made from colored paper, straws and sand. They had a memory verse on them to remind the kids that God loves and cares about them. Emily loves to do these little projects and interact with the kids who come. It's special for us to see our daughter speak Spanish and really get involved with the kids. New Year..... Lets do this! I dont really have pictures for this post, its just words. We have been home back in Mexico for a couple weeks almost. After the trip to Nevada we all felt very rested and refreshed. it was an awesome time visiting friends, family, getting things caught up and RESTING. I spent so much time sleeping and taking naps. Misty and the kids too! There were a couple days of doing absolutely nothing it was great. Christmas Eve we went to church, had dinner, opened presents; on Chistmas Day we got up and Misty and I started packing suitcases and boxes and did the last minute laundry and at about 2 pm we were at the airport and we were back here at about 8:30 in the evening. I was so ready to get back to work and get ready for the upcoming weekend, we had teams arriving soon and one of the biggest deluxe builds was going to happen. SO Saturday I get the money to buy the food and supplies and somewhere along the way before I made it into the Costco to shop I managed to lose a Ziplock bag with about 43 thousand Pesos. I was in shock, and had to tell the base director, make a police report, and then get more money and try it again on Sunday, we got everything out on Monday morning, and then on Monday afternoon I noticed the gas tank was empty, so that was another adventure to get the tank filled, we had to do a HUGE breakfast on Tuesday morning for all our teams building with us. That week is over, so thats good, and now we now have the New DTS here, they start their school today; we even have a couple here from Sparks Christian Fellowship. Misty and I are looking forward to getting to know Nolan and Stephanie Jones really well while they are here. 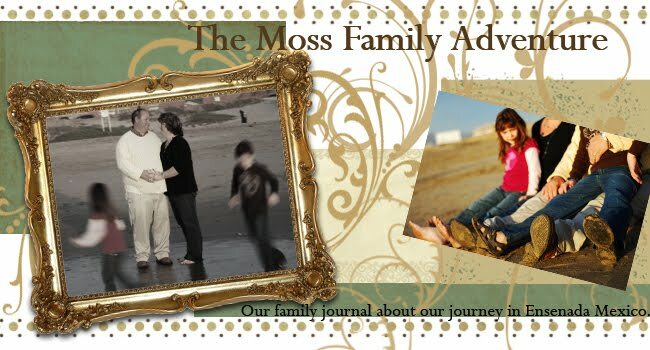 This is a family journal of Bill and Misty Moss and our children Joey 7 and Emily 6 in Ensenada,Mexico.